The NFL's Colin Kaepernick, the quarterback who started the phenomenon of NFL players kneeling during the playing of the national anthem, has finally signed a deal. But not to play football. No NFL team has offered him a contract since he parted ways with the San Francisco 49ers. His new deal is with Nike, which plans to use him for the 30th anniversary of its "Just Do It" campaign. The Nike ad, over an image of Kaepernick, reads: "Believe in something. Even if it means sacrificing everything." If Nike truly believed one must "believe in something. Even if it means sacrificing everything," why hasn't the socially conscious company dumped longtime client Tiger Woods? He not only pointedly refuses to condemn President Donald Trump but also recently said: "He's the President of the United States. You have to respect the office. No matter who is in the office, you may like, dislike personality or the politics, but we all must respect the office." 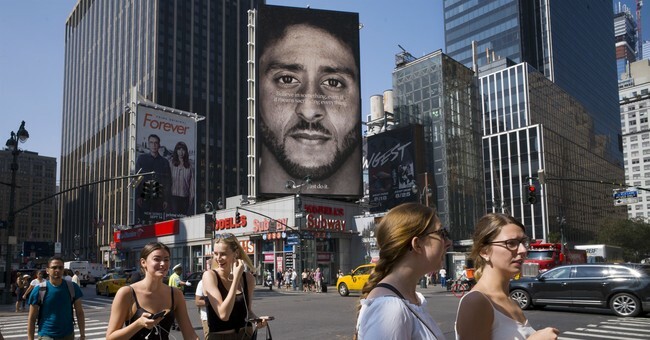 How long has Nike been paying Kaepernick for his "activism"? Some have likened him to Rosa Parks, the civil rights icon who refused to move to the back of the bus, helping spark the modern civil rights movement. Oh, please. Ms. Parks didn't get a shoe deal, and she got arrested for the act of defiance. How has Kaepernick "sacrificed everything"? His NFL career was in decline at the time of his protest. His contract was not likely going to be renewed, even without the controversy that now surrounds him. More important, the NFL, unlike the NBA, does not require its players to stand during the national anthem. So the already rich Kaepernick neither risked losing money nor broke any rule by kneeling. Remember, the protest began as a criticism of the alleged widespread institutional racism by cops. Kaepernick said, "There are bodies in the street and people getting paid leave and getting away with murder." Actually, the data say otherwise. The Washington Post Fatal Force database reports that 19 unarmed blacks were killed by the police in 2016. Almost 8,000 blacks were homicide victims in 2016, and most died at the hands of another black. Unarmed does not mean not dangerous. Ferguson's Michael Brown was unarmed, but his DNA was found on the police officer's gun, indicating that Brown was trying to grab the gun. Two studies in recent years found that police are more reluctant and more hesitant to use deadly force against a black suspect than a white suspect. Harvard's Roland Fryer, a black economist and the author of one of the studies, said, "It is the most surprising result of my career." The notion that the police engage in systemic racial profiling is not just wrong -- it gets people killed. Because of fears of false allegations of police misconduct, cops in Chicago, according the Mayor Rahm Emanuel, have put themselves in a "fetal" position and do not engage in proactive policing. Why fight crime aggressively if it increases interaction with suspects and therefore increases the chance of a false charge of racism against an officer? In Baltimore in 2015, an unarmed black man named Freddie Gray died in a police van while being transported to jail. Six officers, including three blacks, were indicted, with charges ranging from second-degree murder for one, to involuntary manslaughter and assault for the others. At the time of Gray's death, the police department was led by a black man. The second in command was also black. The mayor was black. The majority of the Baltimore City Council was black, as was the state attorney who brought the charges. At the time, the U.S. attorney general was black, as was the President of the United States. Three of the cases were tried before a black judge without a jury. The judge found the officers not guilty. And still protestors cried "institutional racism," even though blacks in Baltimore are running the institution. Trump made the NFL's kneeling protestors a deal that one would have thought could not be refused: "I am gonna ask all of those people to recommend to me ... people that they think were unfairly treated by the justice system ... and I'm gonna take a look at those applications. And if I find and my committee finds that they were unfairly treated, then we will pardon them, or at least let them out. ... If the players, if the athletes have friends of theirs or people that they know about that have been unfairly treated by the system, let me know." Given that the protestors claim there is "structural and systemic racism" and the government runs a "school-to-prison pipeline," they surely can generate an exhaustive list of names. If whites were to spend as much time thinking about how to oppress blacks as Kaepernick thinks they do, they would never have enough time to oppress blacks. As for Nike, it believes in pursuing its fiduciary obligation -- to make profits. It sees no conflict between representing a Woods who refuses to criticize Trump and a Kaepernick who does. If pushing a false narrative of "institutional systemic and structural racism" sells shoes, #justdoit.